The new report, Future Regional Development Policy for the Nordic Arctic: Foresight Analysis 2013–2016, shows the results of a participatory foresight project, summarized in a number of policy recommendations. It captures the everyday life and future prospects of Arctic youth and communities as well as sustainable business opportunities in the Arctic. 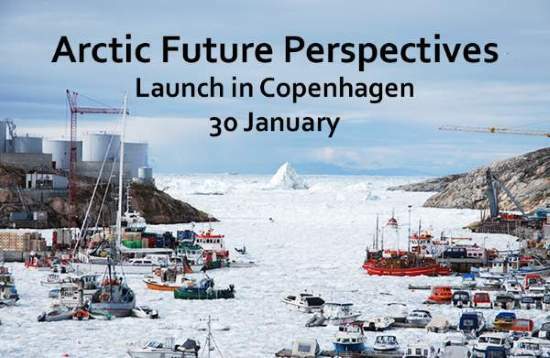 At the report launch, three young women from Greenland, Faroe Islands and Northern Norway discussed their life choices, followed by a high-level panel on sustainable business solutions and the future of the Arctic. “Most of my friends have moved from the Faroe Islands to study and work. I decided to stay until my Bachelor’s degree is finished but I will have to move too to continue my studies”, says Barbara Apol, still living in Tórshavn, Faroe Islands. Aki Mathilde Höegh is from Greenland and has the privilege of having a higher education. She is currently studying in Copenhagen. But she does not see being from Greenland as a restriction: “I do feel that people e.g. from Denmark are more privileged, but I do not see my origin as a restriction by any means. People make the country, and if we believe we can do anything then it must be possible”. Barbara Apol agrees, and says that they need to ditch the small country mindset and believe in themselves. There are a lot of possibilities as there is a lot that nobody has ever done before. The reality for these young women is that they all need to leave their homes to study what they want and to get the highest degree. Kjersti Irina Rosanoff Aronsen is from Northern Norway, from a village of 2,000 inhabitants. For her to pursue her own life goals, studies and career meant leaving home already as a teenager. Social media helps to keep in touch with friends who stayed and pursued other types of life, but she is willing to go wherever the life opportunities take her, and she beieves and youth today are much more mobile than the older generations. Youth panel: Kjersti Irina Rosanoff Aronsen (NO), Aki Mathilde Höegh (GL), Barbara Apol (FO). Kenneth Broman, Secretary General’s Office, Nordic Council of Ministers opened the launch by telling about the Nordic cooperation in the Arctic and Lisbeth Nylund (Kommunal- og moderniseringsdepartementet, Norway) Chair of the Nordic Working Group for Sustainable Regional Development in the Arctic presented the Foresigh project. Foresight analysis, the approach used in the report, is an ambitious bottom-up method. 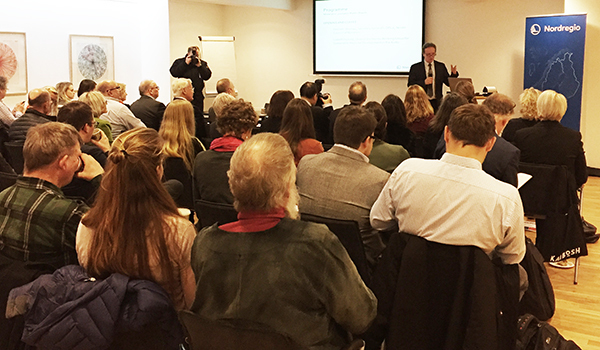 During the project 20 workshops were organised in selected Arctic regions where local people, decision-makers and politicians from local, regional, national and Nordic level shared their views on the potentials and challenges for the future. The study was conducted by Nordregio and commissioned by the Nordic Working Group for Sustainable Regional Development in the Arctic under the Nordic Council of Ministers’ Committee of Senior Officials for Regional Policy (EK-R). 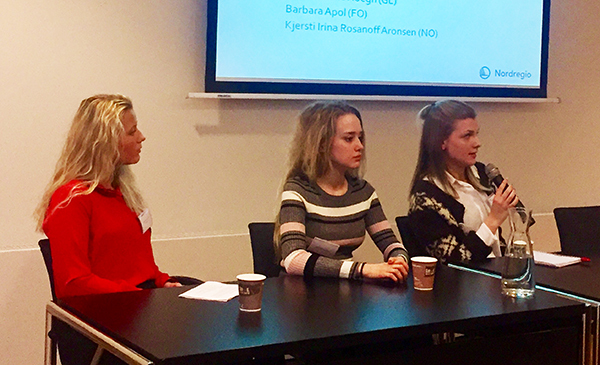 Nordregio’s Senior researcher Anna Karlsdottir and researcher Leneisja Jungsberg presented results from the project and the report which the panelists then commented on with the help of the moderator, journalist Martin Breum. In the second panel Anne Husebekk, Inga Dóra Markussen and Ólafur Ragnar Grímsson discussed Arctic sustainable business solutions. “We need to keep the value creation in the Nordic and not ship raw materials to other countries for production and added value. We need to explore all the possibilities that bioeconomy and bioprospecting have to offer, we already have successful products on the markets”, says Anne Husebekk, Rector of Tromsø University (Norges Arktiske Universitet), and expert in ”Growth from the North”, the joint strategy for Finland, Sweden and Norway. She also comments that in North of Norway the situation where the funding for small and medium-sized companies is very difficult and venture capital for these solutions is almost non existing. “We need to hurry up, slowly. Meaning that we need to keep sustainability issues in mind”, states Inga Dóra Markussen, Secretary of West Nordic Council. Concluding remarks gave Harri Mäki-Reinikka from Foreign Ministry Finland, and according to him we often forget the EU level and all the possibilities and collaboration we could get through that. Summaries from Foresight Workshops in the Nordic Arctic. Policy recommendations based on the report: Future Regional Development Policy for the Nordic Arctic:Foresight Analysis 2013–2016. Seminar report: Storskala Aktiviteter i Arktis (in Scandinavian).